Re: What's on your workbench right now? What's on my workbench? 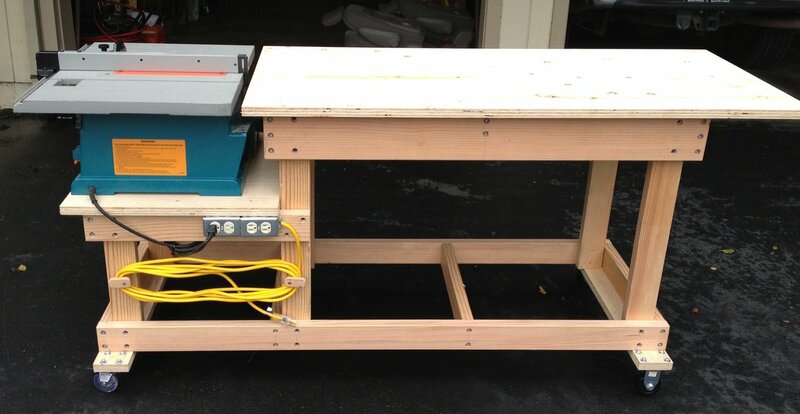 Another workbench! 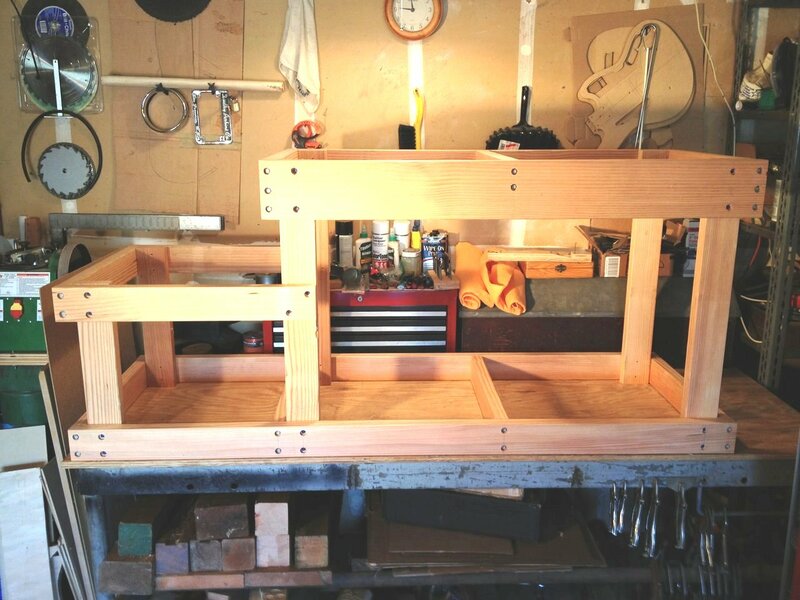 This one will be an assembly bench and at the end it will also house my constructiuon table saw so the top acts as an extension for running long pieces through it. It'll be on locking casters so I can move it where I need it. I suppose I'll eventually put some kind of storage underneath but exactly what is not decided yet. Probably all my guitar patterns and some tools and whatnot. 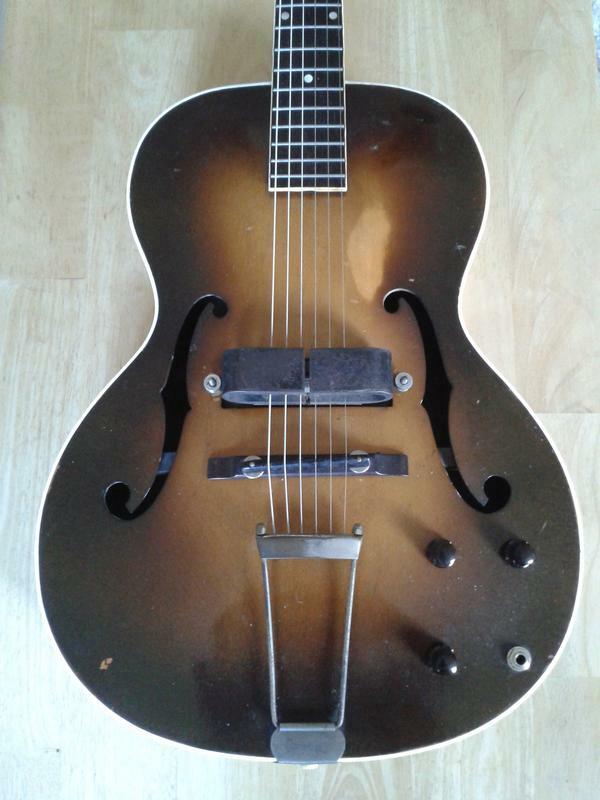 Finally put a decent wiring harness in my 1937 Epiphone Electar Model M. It has a really nifty circuit with volume, treble and bass controls, which G&L ripped off many decades later. 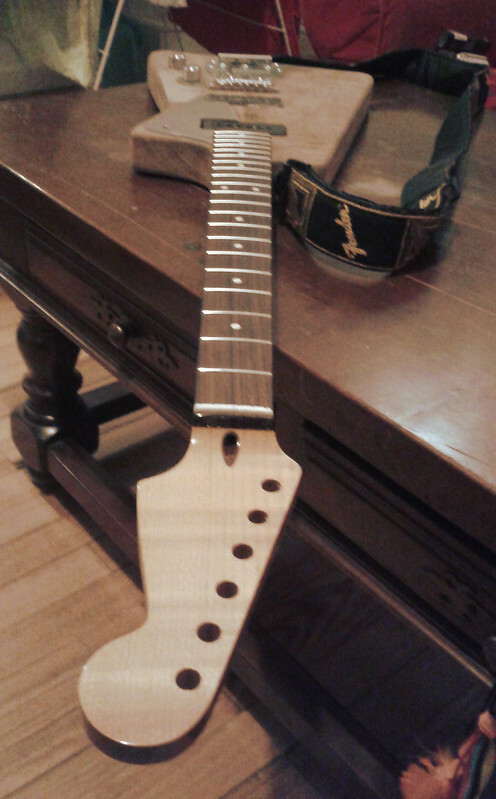 It still needs a neck reset and a refret which is way above my skill level so I'll be farming that out to someone else. Sorry for the shite phone picture. Cool guitar. I like the pickup in it. Thanks! I think the pickup was built under license by Rickenbacker, or possibly built by Rickenbacker themselves. The work bench on the work bench is no longer on it. It's finished, now. I'll make some kind of storage under it, maybe drawers or enclosed shelves. I'll go with it like it is until what I need becomes clear. 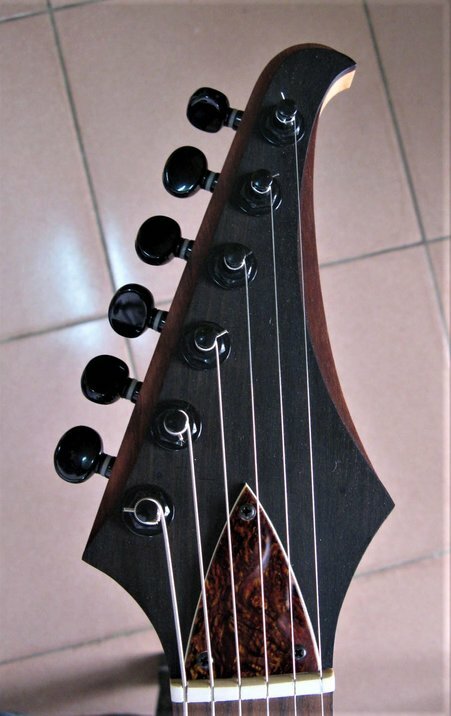 Staggered tuners . . . well they sometimes DO need string trees contrary to advertising. I had yet to have a build where everything goes wrong...Well, that's the one. 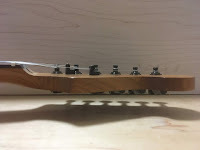 It also happens to be the first guitar someone asked me to make them (for money! ). 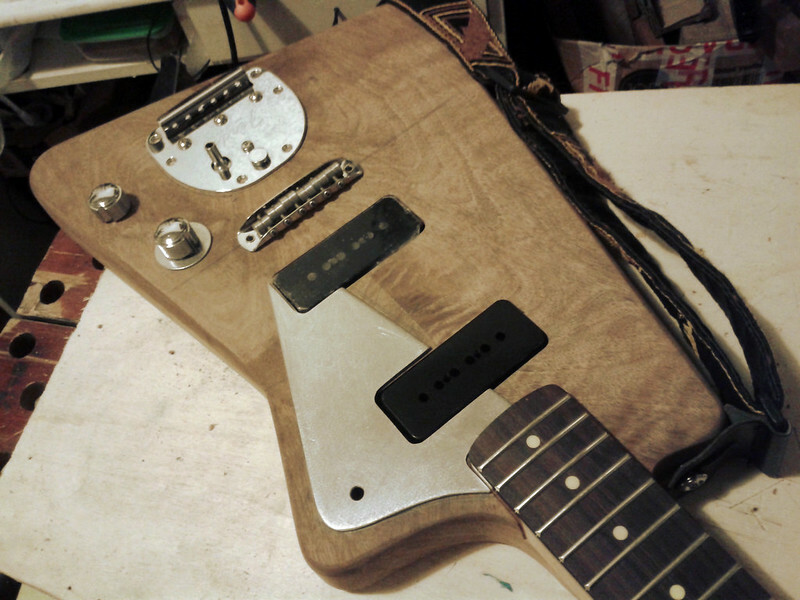 I spent the last couple of days working on this pickguard. Daaaaaaaaaaamn do I hate how hard stainless steel is. But how do I love the results. A purely masochistic material. 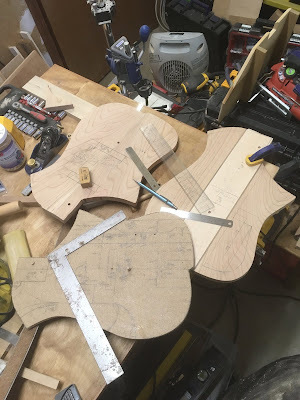 A few guitars I'm finishing up. 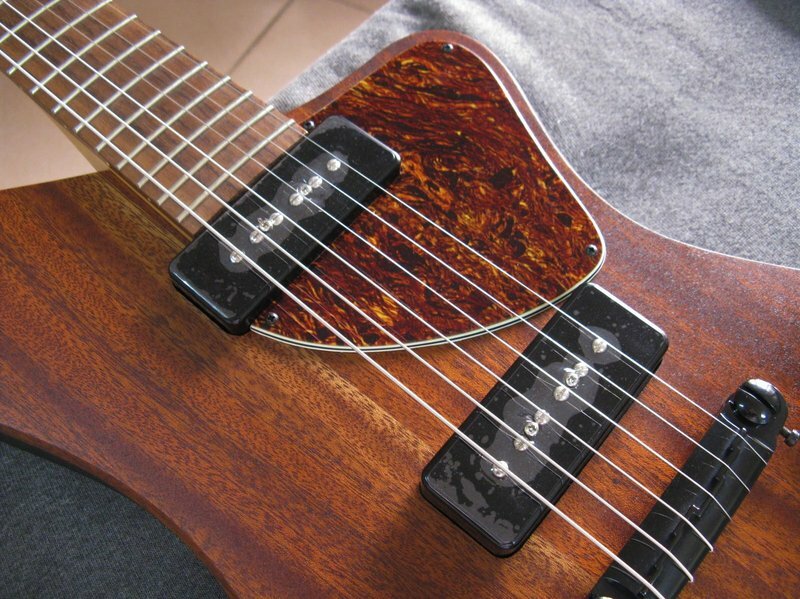 The first guitar is very loosely based on the non-reverse Firebird. Single volume and tone controls with a blend pot. 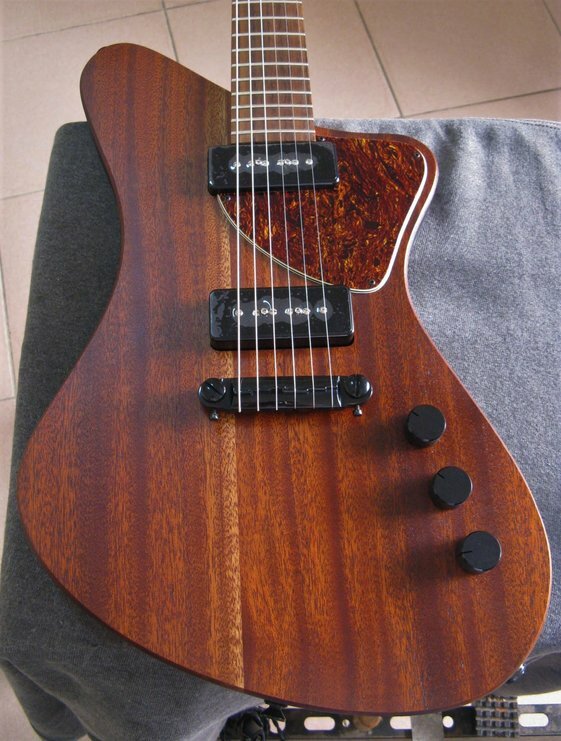 This guitar is based on the Fernandes Revelle. 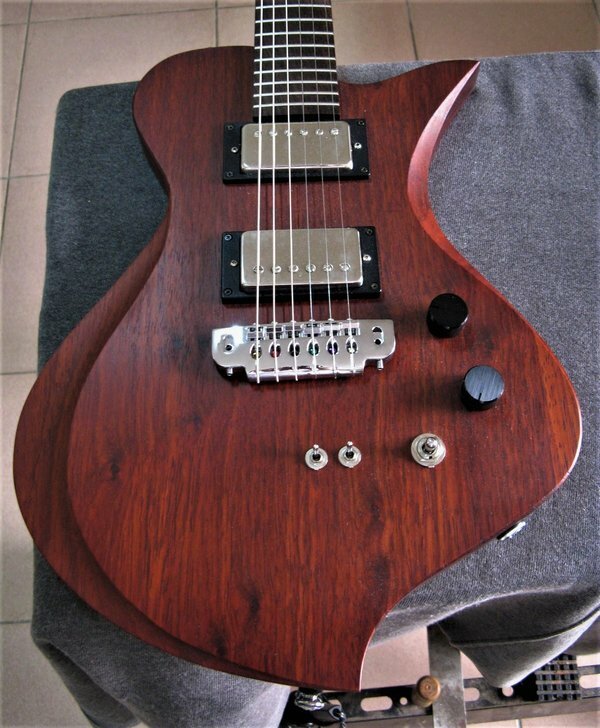 Single volume and tone controls with coil split for both pickups. Thanks for your comment. 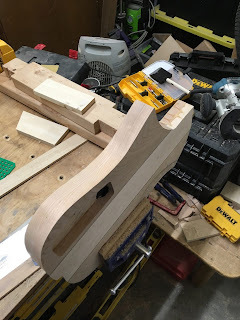 The shape was mostly arrived at by cutting in half my template for the Fernandes Veritgo body and flipping the bottom part over. 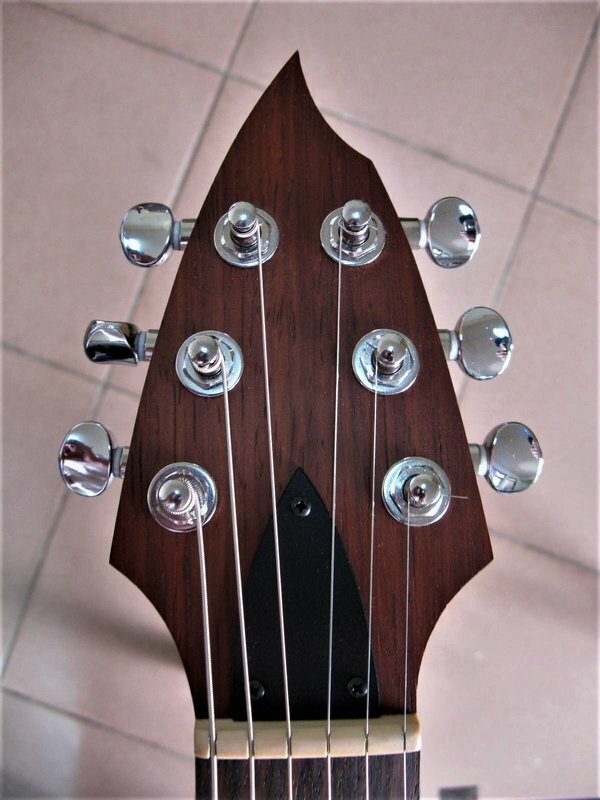 The top wood you see is mahogany. It has more brown in it than what is shown in the photo. That's killer. How does it feel? It looks comfy as hell to wear on a strap or sitting down. Looks beautiful. Clean and to the point. Very comfortable sitting down. I haven't put it on a strap yet, so I don't know if it is neck heavy. I'm still tweaking it, but I do like the sound. Even through a small practice amp, it sounds good. Thanks for your comment. I'm glad you like it. Simplicity is best. Shouldn't be neck/head heavy: the head looks small. 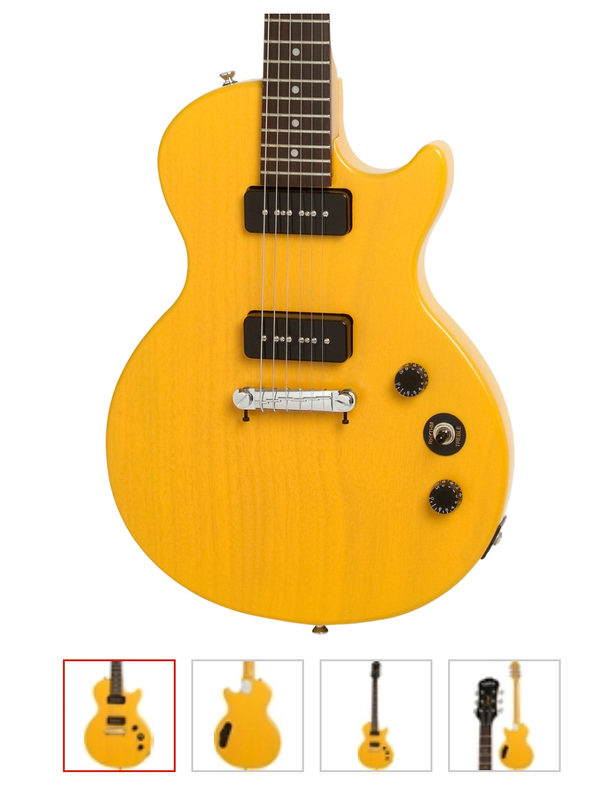 I've kind of wanted a Les Paul Special single cut for awhile. But other than a few minutes here and there in a guitar store, I've never really played LPs. So I decided to make the smallest possible investment into that world. 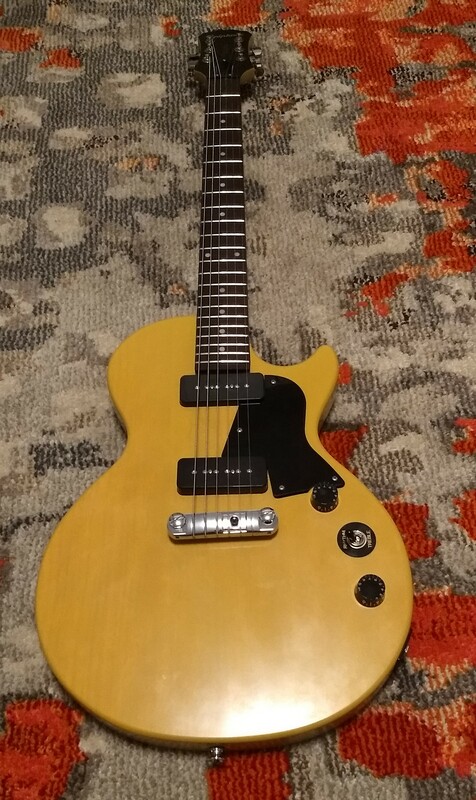 I bought one of those $150 Epiphone LP Special I P90s, just to see how I'd like it. I paid $120 around Xmas and it was supposed to be on backorder until May. Well, as it happens, I received mine at the beginning of January. I just finished up a series of mods to get it into good shape. I'm into this thing for $175 now and I've got to say, I'm really enjoying it. It's featherweight, rock solid, and sounds really good with the factory pickups.